Philadelphia will always hold a place in cinematic history, as it is the first major film to really address the discrimination against Aids and Homosexuality. It also was the beginning of Tom Hanks amazing run of Academy nominated film, that may never be duplicated. The message of the film comes across loud and clear, but not quite in the way that the film's producers intended. Andrew Beckett (Tom Hanks) was a top attorney with one of Philadelphia's top law firms, when all of a sudden he's fired. Beckett believes he was set up and fired because he has Aids, but can he prove it in court? As the film goes, it is easy to see the discrimination and stereotypes that Beckett has to face on a daily basis, and weather or not you accept homosexuality, it's powerful ending will make you feel for the plight of any homosexual who suffers from this horrible disease. The majority of this film takes place in the courtroom and centers around Beckett's case against his former employer, and as someone who has studied the law, I can tell you that the case destroyed the merits of this film. There are things that both sides do, that would never be allowed in a court of law, and in my opinion neither side really makes it's case. As far as the legal aspect of this trial goes, it is very subjective and would never lead to the verdict that was handed down. As for the stars of this film, they are the ones that make it as powerful as it was. Hanks gives a performance that was absolutely worthy of the best actor award, as following him and his story is really what gave the film it's reputation. Quite ingeniously, Hanks is paired with Denzel Washington, who plays his attorney. Washington's character is meant to represent how much of the audience felt at that time, as even while representing Beckett, he speaks out about Aids and Homosexuality. The more he works to represent Beckett, the more you can see his attitude change, the same way the audiences attitudes change as the film moves alone. 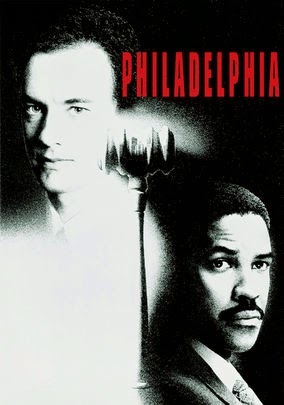 I loved Philadelphia for it's performances and it's message, but as far as the story goes, the trial is the majority of the film, and the trial is completely unbelievable. In my opinion the trial takes away much of the film credibility. The issue and the case should have been more clear cut and the legality of it all should have been easier for the audience to understand. That being said, if you choose to watch this film, you will be hard pressed to find better performances by a better cast, but the story will leave you feeling somewhat incomplete.